The BRAVEMIND system recreates virtual environments in a head mounted video display that attempts to match scenes described by the veteran, without recreating the actual trauma. 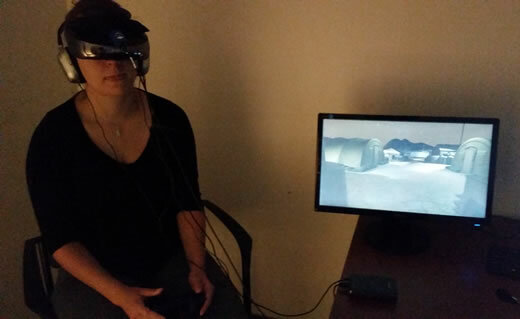 Clinical researchers in Emory's Veterans Program will study the use of virtual reality exposure therapy to treat people suffering from posttraumatic stress disorder (PTSD) due to military sexual trauma. The current study will evaluate the effectiveness of the BRAVEMIND system in those with PTSD due to military sexual trauma (MST). For this study, BRAVEMIND has been updated to include barracks, tents, private living quarters, latrines, offices, remote buildings and vehicles. These scenes create multiple options that should help participants access their memories. It is important to note that the virtual reality exposure therapy will not recreate the sexual trauma. Rather, this experimental treatment for MST will help participants confront their own memories in a way that could decrease distress over time. This type of imaginal therapy has been successful with assault survivors for over 20 years. "It is our hope that the VRE system will offer an effective, less stigmatizing treatment option for individuals with MST who find traditional 'talk therapy' less helpful," says lead researcher Barbara Rothbaum, PhD, professor in the Department of Psychiatry and Behavioral Sciences at Emory University School of Medicine and director of Emory's Veterans Program. The clinical study is available to female and male veterans ages 18-80 of all eras, and will consist of six to 12 individual treatment sessions with a therapist. An initial assessment will include an interview with a study clinician about PTSD symptoms and an introduction to a new technology using a virtual human character. This technology, called SimSensei, involves a short interview session with a virtual therapist "Ellie" and captures face/body gestures and voice recording. In earlier studies, this approach has been reported to be less threatening by users and is viewed as providing a safe, non-judgmental assessment. For additional information, contact Zehra Kahn 404-712-2013 or zkahn4@emory.edu.